The Dirt Defender Gold grade cover is constructed of our strongest and most tear resistant material. This cover features rugged U.V. stabilized woven polyethylene that protects it from sun, snow, wind and ice. It features a black underside to retard algae growth and heat sealed seams to ensure a crystal clear pool next spring. The cover features a big 4 foot overlap that means it will fit above ground pools with wider top rails unlike smaller 3 foot overlap covers. This Dirt Defender Gold grade cover is held secure by a heavy duty cable and winch tightener that is anchored to the cover by rip proof metal grommets. This rugged cover is built to last, backed by a 15 year warranty (3 years full rated). Invest in quality this fall with Dirt Defender Gold. This Dirt Defender cover comes in royal blue with a black underside. 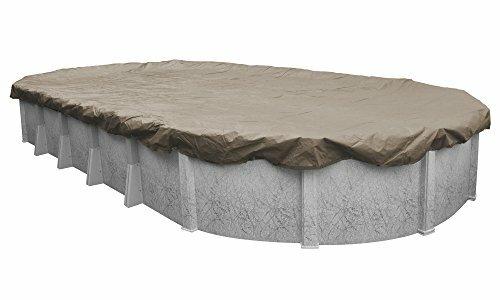 The Pool Mate Sandstone Above-Ground Pool Cover protects your pool during harsh winter conditions. This professional-quality, polyethylene cover blocks out any dirt and debris throughout the winter. The Sandstone cover prevents algae growth by blocking UV rays from entering your pool. Pool owners who use a Pool Mate Sandstone Pool Cover and close their pool with the proper winterizing chemicals will have a clean pool in the spring that will be easy to open. It is always recommended to open your pool by mid to late May. This cover features a 4-foot overlap making it easy to install. Grommets are placed every 4 feet and should be used with the included cable and winch. This high-quality, lightweight cover with heat sealed seams is built to last longer. 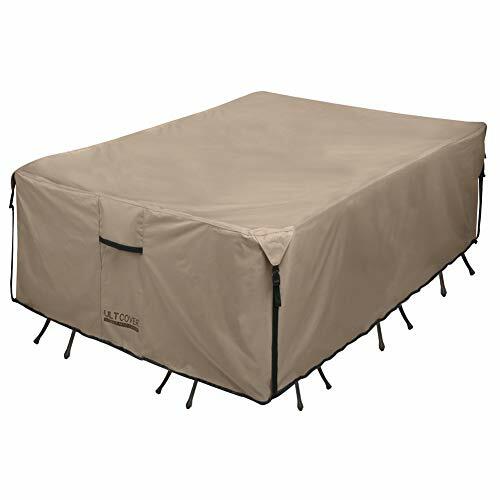 The Pool Mate Sandstone Above-Ground Pool Cover comes with a 12 year warranty. Above-Ground Winter Cover with 8-Year Warranty. This Defender entry level cover has the strength and durability of covers costing twice as much. Rugged polyethylene scrim and coating means this cover can withstand winter’s worst. Defender covers are U.V. protected so they will last for years in direct sunlight. The cover’s black underside retards algae growth and heat sealed seams means a crystal clear pool next spring. The big 4 foot overlap ensures a proper fit and helps the cover from stretching and ripping like covers with 3 foot overlaps. This cover is backed by an 8 year warranty (1 year full rated). This Defender cover comes in a dark navy blue with a black underside. This pro-strength polar winter cover is made with extra-wide fabric to reduce the number of seams, resulting in fewer stress-areas and a longer-lasting cover! 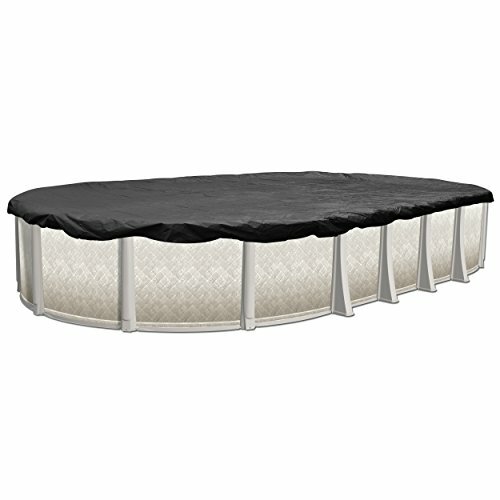 Triple laminated poly-constructed inner scrim is topped by a premium weather resistant top coating to resist damaging U.V. rays. Exceptionally lightweight, making installation on your swimming pool a snap! All seams are heat-sealed (not sewn) to prevent water from seeping through the cover into your swimming pool. All pool covers come complete with heavy-duty vinyl coated cable and winch, and have a black underside to inhibit algae growth. Pool cover color is Navy Blue. Please order by pool size! All covers have a 4 foot overlap to accommodate an 18-inch water drop. 10 year warranty. No more swampy water pooling on your winter cover! Our fine mesh winter cover features a super-strong fine weave fabric which enables rain and melting snow to pass through while prohibiting leaves and larger debris from contaminating your pool water. Spring clean-up is a snap, just remove pool cover and vacuum fine dirt from the swimming pool floor! Put an end to the timely task of pumping off that contaminated puddle of water from your winter cover. No more accidental spills in your pool during cover removal! Comes complete with heavy-duty vinyl coated cable and metal winch. Designed to accommodate an 18-inch water drop, please order by pool size. 3 Year Warranty (1 Year Full). The Pool Mate classic above-ground pool cover protects your pool during harsh winter conditions. The polyethylene material stops algae growth by preventing UV rays from entering your pool. This solid pool cover also blocks dirt & debris from getting into the water. Pool owners who use a Pool Mate classic pool cover & close their pool with the proper winterizing chemicals will have a clean pool in the spring that will be easy to open. it is always recommended to open your pool by mid to late may to prevent algae growth. The cover should be able to float comfortably on the water. Please order a larger size if you have a big top rail. Grommets are placed every 4' & should be used with the included cable & winch. The lightweight material is more durable than regular covers because all seams are heat sealed for better performance. The Pool Mate classic above-ground pool cover comes with an 8-year warranty. Want more Oval Winter Cover similar ideas? Try to explore these searches: Tone Leaf Pin, Winston Contemporary Print, and Emerald Single Rare Card.